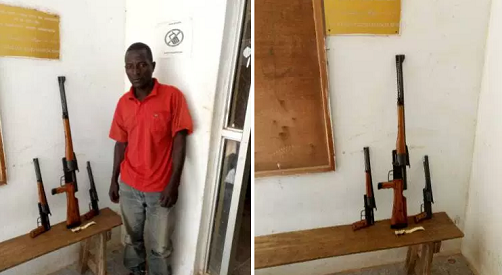 The National Drug Law Enforcement Agency (NDLEA) in Jigawa has arrested a man with firearms heading to Benue state. The deputy commander of NDLEA in Jigawa, Oko Micheal, revealed this to journalists on Tuesday at Dutse, the state capital. Mr. Oko said operatives of NDLEA were on normal operation around Jahun – Gujungu Road where the suspect was arrested. “The suspect, identified as Salisu Mahmuda was arrested on Sunday 4, February, 2018 with some three locally fabricated firearms (2 locally made revolver pistol, one cut to size revolver rifle) with five-rounds of live ammunition,” he said. According to NDLEA, the suspect and the items recovered will soon be transferred to the state police command for further investigation. The suspect, Salisu Mahmouda, said he is an indigene of Kaduna state. He attended a school in Nasarawa where he later became involved collection of discarded metals between Nasarawa and Benue state. He said two men of Tiv and Fulani ethnic nationalities respectively, ordered for firearms, and he eventually found someone who fabricated the arms for him in Labara village in Kano. “I am able to come down here through a friend of mine whom we schooled together in Nasarawa. He is the one that led me to the man that manufactured the firearms in Laraba village,” he said.